The DR8 8SP 19.2 x 16 x 11" Desktop Rail Rack by Middle-Atlantic will help you quickly and inexpensively organize your desktop processing and test equipment. This rack comes in 8 space size to perfectly fit your needs. This model extends upward slightly for top notch security. Imagine having convenience, organization and accessibiliity all within reach and within your budget. This rail rack is so easy to put together, you'll think you make a mistake. Fear not; this 8 Space is designed for quick, pain-free assembly. Box Dimensions (LxWxH) 29.5 x 5.2 x 3.2"
8 Space Desktop Rail Rack is rated 4.7 out of 5 by 6. Rated 5 out of 5 by David G. from Simple and Well Built I am using this rack as a temporary space for my ADR/VO gear. It is well built and comes packaged well. I have purchased this brand before. 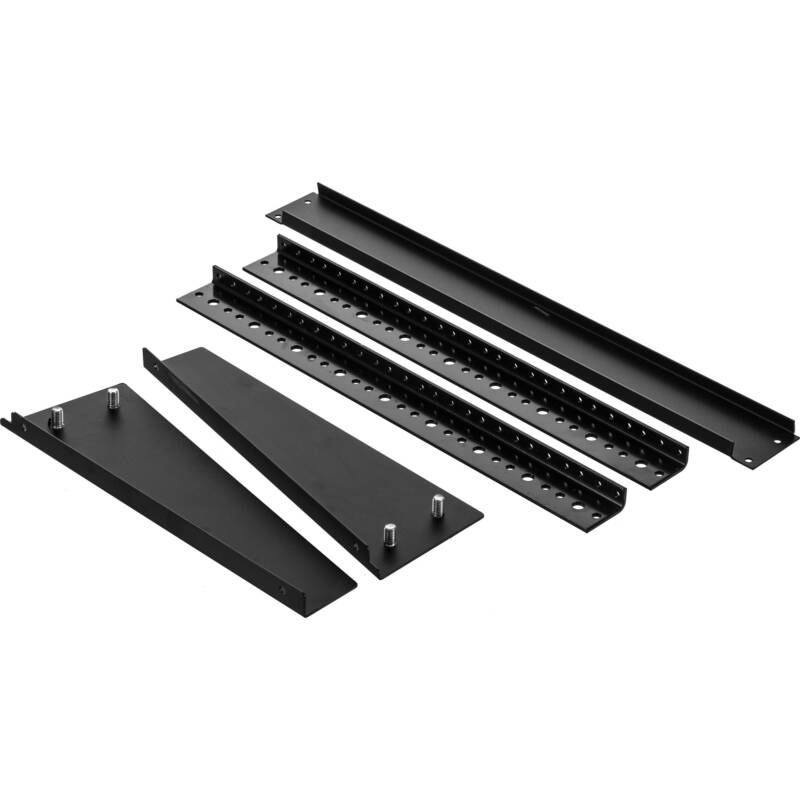 The package includes the front, two sides, two rails, screws to attach the pieces together, four rubber feet and some wood screws if you opt to screw it down to a desk versus using the rubber feet. It does not include any rack screws for the rack equipment. If you do not already own some rack screws, you will require the Middle Atlantic HPS 10-32 3/4 Philips Truss-Head Screws & Washers package. Rated 5 out of 5 by BKN7000 from Great desktop rail rack I was looking for a nice simple tabletop rail rack for a synth and a couple of effects units and at first I was skeptical about the sturdiness of this thing since it doesn't have a brace in the back or any cross-bracing. But after someone in a message board online said he uses his with gear that was more than twice as heavy as my units, I thought I'd give it a try. Needless to say, this was exactly what I wanted and it is sturdy as heck. The steel is typical thick gauge and the bottom bolts that connect the vertical rails to the base are firm and secure. Very well made. What's also nice is that it comes with rail screws already ... There's just one thing to watch out for: make sure you use the right screws for the faceplate at the bottom and don't get it mixed up with the rail screws. It's somewhat obvious, but it isn't mentioned in the packaging. I think they should label it. I almost ruined the thread on mine, but I noticed it just in time. Anyway, I recommend this rail. It's a well made product with a nice minimal design. Rated 4 out of 5 by Des the Designer from Great Little Rack This is a simple little rack - but it's sturdy and holds everything I need it too hold. Not too bulky to move around if I need to. A great, inexpensive solution. Rated 5 out of 5 by Rich W from Compact, secure rack Good for lighter rack-mount processing equipment where you don't need/want an enclosed rack cab. Comes broken down, easy to assemble. Rated 4 out of 5 by Anonymous from Great Simple Rack This rack worked perfectly for the space I have. A little challenge to put together.